as, I should imagine, have most of us. I have been there in spirit undeterred. Don’t need to be told the details of tragic loss and travesty. But there’s nothing like a senseless, barbaric, vicious attack on innocents to rightsize all the banalities of your own life, is there? Quite by chance I came across this old photo of Mum, Dad, Steve and myself at my graduation from Salford. I didn’t get a brilliant degree, but I got one. Spent way too much time partying and having fun. It was a miracle I got one at all really! and got to strut my stuff in a mortar board for a day. See the building on the right? That was the Maxwell Building or Tower as I recall. Back in the day, that was where we held all the big gigs and concerts. I worked in the Union bar (of course!) and got to see loads of great bands coming through in the late 70’s. The bar was situated below the auditorium, so we would serve drinks until the gig started, clean up, and then go watch the band for free. to get the crowd to stop pogoing, because it was compromising the structure of the building. So what did the young Irish prat do? Yep, he kicked off about the establishment, and about the system, and he incited them to jump even higher in unison. The windows started popping, cracks quickly started appearing in the bar below, we ran for our lives, the concert was stopped, the building was evacuated. And the building remained closed for the rest of my years at Salford. Maxwell Hall was deemed unsafe and required a complete rebuild. Our language faculty was at the very top of the building, and we couldn’t use it any more. We were farmed out to other engineering blocks on campus and along the Crescent for the remainder of my time there. It was a shambles. So every time I hear or see Geldof on TV, the first thing that goes through my mind is that that stroppy little shyster caused an entire 12-storey building to close down. Do you hear about that? Nope. You hear all about Live Aid and Sir Bob, but you never hear about the chaos he caused at Salford University. One of the best things about the Linguistics faculty on the 11th and 12th floors was the Pater Noster lifts. If you aren’t familiar with them, they are lifts without doors, like a continuous, ever-moving chain of revolving compartments, and you just had to jump on and off at the appropriate level. Look! I found a photo from the Salford Uni archives. Cor blimey! That brought back memories. At first, the Pater Nosters were pretty terrifying. But once you got used to them, they were easy to navigate. And the café was on the top floor, so there was a constant stream of people pouring upwards and downwards. It really was great. I think they’ve done away with them now. Health & Safety to the rescue! Ahh but those were the days, my friend. I remember those lifts at a hospital I worked at 1970 ish. I didn't have a very high opinion of BG and it has sunk even lower now ! What a brilliant blog Barbara. Thank you for sharing your treasured memories with us. You haven't changed a bit, wouldn't need to be told it was you in that photo. Same with your dad too. I've got a science degree, did it part time later on, developed CFS half way through, (the degree course wasn't the trigger, just coincidental). Hope delving into your memories have helped calm you in your head, and taken you to a better place, even if just for a short time. Hope you can have a lovely weekend, just chilling and doing what you want to do. afield, obviously! Knew it didn't look right! Head no working again today!!! You will be OK Brenda. I can only watch on freeview or on my pc which doesn't stream well. However according to Hayley on the Hochanda fb page the ODS launch will be on at 6 pm so we won't miss shows! Hochanda will be on now from 6 am til 7pm on freeview. I do wish that Virgin Media would air it! Hi Barbara, lovely photo of all of you. Apart from 'I don't like Mondays' I'm not a fan of Bob Geldof, even less now! It seems alcohol follows you around what with your blog about optics the other day ! Gosh Barbara you have taken this golden oldie back to the UNI days and after. While I was studying, I worked at ICI and they had Pater Noster lifts. I jumped in on someone the first time I used it and wrapped my umbrella round him! He was only one of the chief exes! Second time I misjudged getting out and twisted my ankle. But I think the silliest was – my friend and I decided to do a round trip – we thought we would be squashed when the lift reached the top or the bottom. Yes we also thought the earth was square. Thank you for bringing back my memories too – they certainly were the days. Peaceful, happy weekend to everyone. I love hearing all your memories come back too. Isn’t it interesting, how we can recall like this? Aren’t humans actually amazing? Capable of so much! And I mean good! What lovely memories today, oh yes I'd recognise your family, not changed a bit, just a tad older!! Those lifts sound quite scary. You must have seen some great bands over the years, and some sights! Wow pogoing bringing the building down, that's some power but what problems it caused for you for the rest of the years you were there. Hope you get a chance to enjoy the sunshine this weekend. 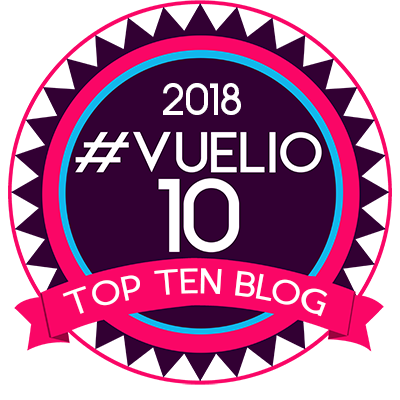 Your blog is brilliant today Barbara! The photo of you at your graduation is fantastic… Your mum and you look identical and your Steve is the spitting image of your dad! It made me think back to my uni days. Whereas you came up the country to Manchester I went down to Bath to the teacher training college. Our site was built behind one of the beautiful crescents and the student accommodation was in the crescent itself. We had a resident matron to look after us girls….home economics meant it was mostly girls that chose this course when I was at uni in 1979-1982. So this matron was to keep her eye on us and had certain rules if we were to entertain a gentleman guest…. Haha! Let me tell you about that sometime! I think my uni days were magic! I did enough to get my degree but made sure I enjoyed being a student as fully as possible. Bath has a lot of really happy memories for me and those include Colin too…I got engaged to him before I went to uni and married the year I graduated and yet people doubted we'd last! Ha! 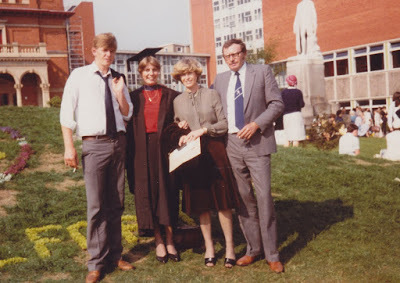 Can't believe I graduated 35 years ago…seems like yesterday sometimes! Still they do say that the happiest memories are the strongest! Whilst there is so much sadness on the news and around us it's good to think happy thoughts. I remember feeling very cool and impressed with myself as a very young 17 year old being invited to a party there. The party wasn't all that, everyone seemed soooo old so off we headed to find some fun. I was the one nominated to see what happened when the lift reached the top. Guess what, it didn't even turn upside down! We were mesmerised with them until that point. Ended up returning to the paty after having all our illusions and theories shattered. I did actually get a kiss from a boy that i liked but he turned out to be a bit boring. There was no way he was going over the top in them lifts! Great glimpse into your little world. They had those lifts at Crawley College – fortunately never had to use them as we were in the Annex. Your story of the pop concerts brought back many memories. My brother was in a rock group in the 60s and used to be a support group for many of the big stars gigs at Uni's around the country. They travelled in an old white van, complete with a huge double keyboard organ at one time. He then progressed to a more manageable one – and the girls used to go wild when he played it with his feet! Those were the days! Wow, your mum is stunning, and a fantastic Purdey haircut. What a great photo. When I worked for a high street bank our training was in Manchester, and they had a Pater Noster lift. I was terrified at first, but you do get the hang quite quickly. Some of the crowd used to stay on till it got to the top, or bottom, where it did a sideways shuffle in the pitch black. But I was too scared, haha. 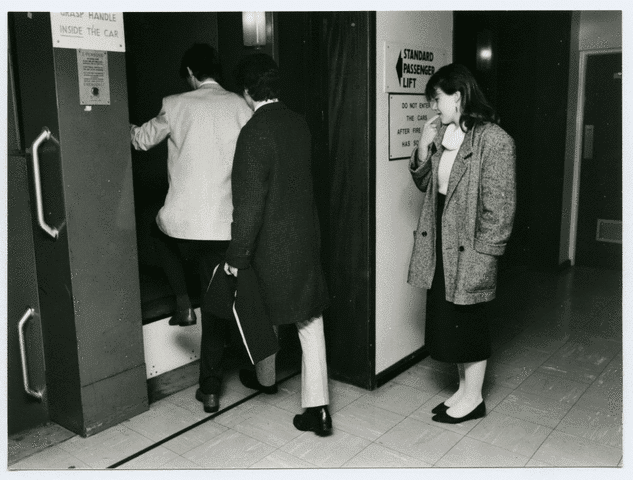 Paternoster lift is still in use in the Library at Essex Uni in Colchester. I'm sure all first years have nightmares about using it!! They still have a paternoster at Sheffield uni – one of the few still remaining and still used! Dear Barbara…you are so like a dear friend that shares a piece of her heart to me each day. Your spirit undaunted, your talent extraordinaire! I thank you from the bottom of my heart to yours for no matter the story you are telling, I feel every emotion, love every word. Especially the sassy bits 🙂 Keep on keeping on! I and the rest of your fan club adore you!